For residents at the Philadelphian, a condominium in Center City, Philadelphia, saving energy is practically a way of life. The management team and resident-led Green Task Force have completed many projects in the 54-year-old building that range from installing energy-efficient windows to upgrading the building’s heating and cooling system. Through those efforts, the Philadelphian has saved more than $1.5 million in energy costs and garnered national ENERGY STAR® certification. Thanks to PECO Multifamily Solutions, the condo building recently found yet another way to improve energy efficiency, increase sustainability and help residents enhance their living spaces. When Joan Batory, chair of the Philadelphian’s Green Task Force, learned how easy it was to have PECO install free energy-saving products in owners’ units, she quickly brought the news to Frank Bonom, general manager at the condo. Bonom was immediately on board and arranged for a complimentary energy assessment, during which a PECO expert pointed out valuable energy-saving opportunities. “I was surprised by the amount of energy we could save by simply switching to LEDs,” said Bonom, who worked with Batory to get residents interested in having LEDs installed in their units. In total, hundreds of residents participated in the PECO free direct installation program. 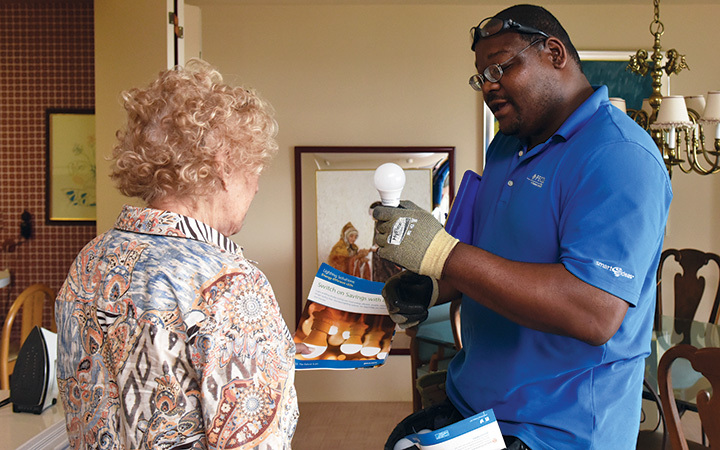 They received energy-saving LEDs and expert recommendations on how to best use their new bulbs with dimmer switches. Batory is delighted that the free LEDs will continue to reward residents with energy savings, which is a great reason for any multifamily property to participate in PECO Multifamily Solutions. Please complete the information below, so we can get the right information to you. Yes, I want to schedule a free energy assessment of my multifamily property. Yes, please contact me to schedule installation of free energy-saving products in my tenant units. By providing your email address you agree to receive occasional emails from PECO. You may unsubscribe at any time.